Christmas magic reigns as the Candy Cane Express chugs out of the station at the Hesston Steam Museum in the LaPorte County community of Hesston. The annual event features train rides and a visit with Santa. The story of the first Christmas comes to life as visitors trace the journey of Mary and Joseph from the community of Bremen to a farm outside of town in a unique live dramatization of the birth of Jesus. On the way to the manger, walkers visit a Biblical-era village. 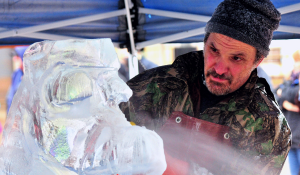 Works of art emerge from huge blocks of ice as professional ice carvers create amazing sculptures. Roam the streets of downtown Shipshewana to watch the artists in action.Then taste masterpieces of a different kind at the chili cook-off. 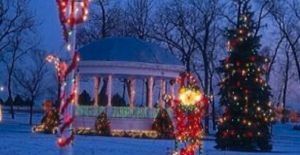 More than 5 million individual bulbs set Michigan City’s Washington Park aglow, lighting up a variety of holiday and traditional displays on view as you drive through the park. The displays feature a variety of themes, some lighthearted, others nostalgic and still others stunning panoramas. 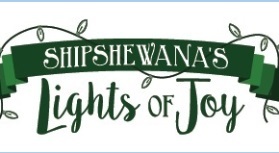 Visitors love Shipshewana at holiday time, and now there’s even more reason to visit as a fantastic drive-through light display debuts. More than 2 million LED lights illuminate both whimsical and religious scenes along the mile-long route. 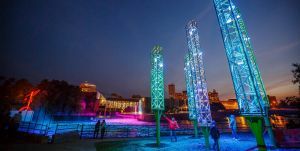 Dazzling light displays in this Valparaiso park get visitors in the holiday mood as they drive past an array of scenes, many custom-made by Sunset Hill’s maintenance staff. 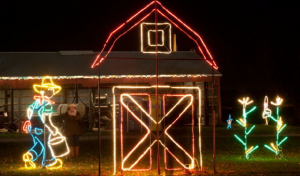 You’ll see unique lighted, moving scenes such as a 20-foot-tall roller coaster, Santa and his reindeer, and an Indiana farm. Grab your hat and mittens and embrace winter in South Bend! The Merrifield Park Ice Rink offers skating and skate rentals several days a week. Squeals of delight fill the air on the innertube runs at Ferrettie/Baugo and St. Patrick’s County Parks. 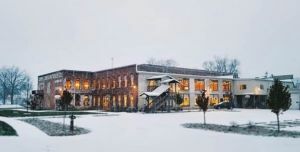 St. Patrick’s also offers three special cross-country skiing nights. 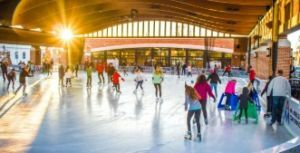 Skaters love the NIBCO Water & Ice Park, complete with an ice rink and path, skate rentals, and a warming facility with concessions. Cross-country skiers head for the groomed trails at Ox Bow County Park in town and Bonneyville Mill Park a few miles away. Both parks offer sledding and snowshoeing too. Winter turns the Indiana Dunes into a quiet wonderland perfect for hiking along snowy woodland trails and among sandy dunes. Head out yourself anytime or join naturalists at the Indiana Dunes State Park in Chesterton who lead special hikes during the holidays–one on Christmas Eve morning for a stroll through the dune forests and another New Year’s Day for a more rugged trek through the high dunes. At Valparaiso’s open-air William E. Urschel Pavilion, you’ll hardly notice you’re outdoors. A roof protects you from any wintry elements, and lights, music, and a well-maintained rink make ice skating a dream. Part of downtown’s Central Park Plaza development, the pavilion includes an indoor area for skate rentals and hot drinks during the winter months. The whole family can work off that excess energy that being cooped in the winter can create by cutting loose at two great venues in Mishawaka. 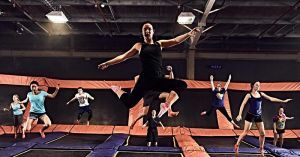 At Sky Zone, everyone loves to jump on wall-to-wall trampolines and dive into a foam pit. Strikes & Spares Entertainment Center features bowling, glow-in-the-dark mini golf, go-karts and arcade games. Here’s an ultimate winter escape for a few hours or a few days! 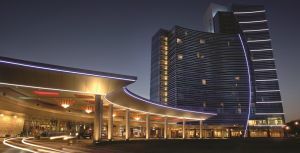 At the Blue Chip Casino, Hotel & Spa in Michigan City, the beat goes on 24/7 year-round with 65,000 square feet of gaming space, including 1,700 slot machines and 40 table games. Add in musical entertainment, fabulous food, luxurious lodgings and a pampering spa to complete the fun. 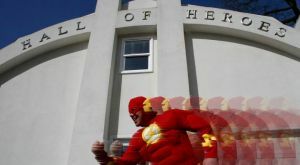 Hall of Heroes Superhero Museum, Elkhart – Holy Museum, Batman! Even Robin would be amazed at this super fun museum filled with comics, toys, displays and even Captain America’s shield and a replica of the Bat Cave. Kidsfirst Children’s Museum (and more! 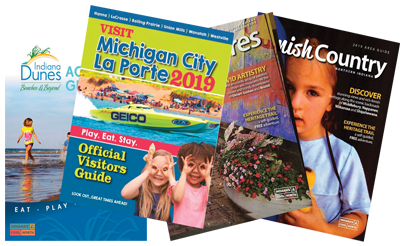 ), South Bend – Youngsters will love finding out what it was like to learn in a one-room schoolhouse and live in a cabin through hands-on exhibits. It’s part of The History Museum complex where you can tour a Victorian mansion and 1930s worker’s cottage. 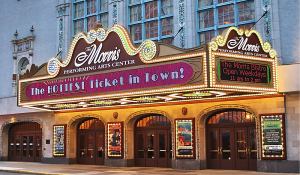 The historic Morris Performing Arts Center provides an outstanding venue for Broadway shows such as the upcoming Evita, the South Bend Symphony Orchestra, plus other entertainment. 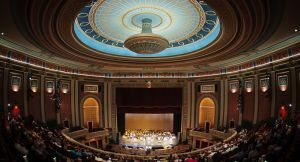 Also in town, Notre Dame’s DeBartolo Performing Arts Center features concerts, theater performances and film. 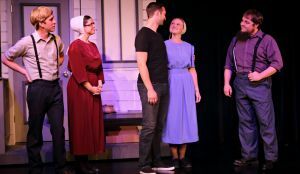 This state-of-the-art complex includes the intimate Blue Gate Theatre, featuring for the holiday season a heartwarming Amish-themed musical, Christmas in Paradise. Built in 1923 as a movie house, this historic theater has been completely renovated. It features concerts, theater and films. During the holiday season, the Beach Boys are scheduled, as well as a lavish theatrical production of White Christmas. Experience thrilling action as the Fighting Irish compete in men’s basketball and hockey and women’s basketball at the University of Notre Dame in South Bend. Amish Treasures and More – You can’t beat the shops in Shipshewana or the Antique & Miscellaneous Auction held each Wednesday for Amish goods and myriad finds. In Nappanee, Coppes Commons spotlights Amish works and other unique goods. Bargains – Lighthouse Place Premium Outlets in Michigan City features daily bargains in 100 name-brand stores. Outdoor Paraphernalia – Bass Pro Shops in Porter has everything imaginable for outdoor sports, adventure, and fun. A Bit of Everything – In Mishawaka, more than 120 specialty shops fill University Park Mall.